Many of us as leaders believe we're effective at "multitasking." The reality, however, is that our brains are just not physically wired to multitask. 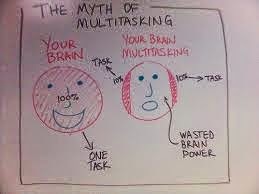 In reality what happens when we attempt to multitask is that our brain quickly shifts from task to task. This switching from task to task can lead to brain fatigue. It also reduces accuracy and productivity.